The "standard interpretation" of the Turing Test, in which player C, the interrogator, is tasked with trying to determine which player - A or B - is a computer and which is a human. The interrogator is limited to using the responses to written questions in order to make the determination. The Turing test is a proposal for a test of a machine's ability to demonstrate intelligence. It proceeds as follows: a human judge engages in a natural language conversation with one human and one machine, each of which tries to appear human. All participants are placed in isolated locations. If the judge cannot reliably tell the machine from the human, the machine is said to have passed the test. In order to test the machine's intelligence rather than its ability to render words into audio, the conversation is limited to a text-only channel such as a computer keyboard and screen. It was described by Alan Turing in his 1950 paper "Computing Machinery and Intelligence," in which Turing considers the question "can machines think?" Since "thinking" is difficult to define, Turing chose to "replace the question by another which is closely related to it and is expressed in relatively unambiguous words." The question he attempts to answer is whether a machine can pass the Turing test. The question of whether or not it is possible for machines to think has a long history, which is firmly entrenched in the distinction between dualist and materialist views of the mind. From the perspective of dualism, the mind is non-physical (or, at the very least, has non-physical properties) and, therefore, cannot be explained in purely physical terms. The materialist perspective, on the other hand, argues that the mind can be explained physically, and thus leaves open the possibility of minds that are artificially produced. Researchers in Britain had been exploring "machine intelligence" for up to ten years prior to 1956. It was a common topic among the members of the Ratio Club, an informal group of British cybernetics and electronics researchers that included Alan Turing, after whom the test is named. It is not difficult to devise a paper machine which will play a not very bad game of chess. Now get three men as subjects for the experiment. A, B and C. A and C are to be rather poor chess players, B is the operator who works the paper machine. [...] Two rooms are used with some arrangement for communicating moves, and a game is played between C and either A or the paper machine. C may find it quite difficult to tell which he is playing. Thus, by the time Turing published "Computing Machinery and Intelligence," he had been considering the possibility of artificial intelligence for many years. This, however, was the first published paper by Turing to focus exclusively on the notion. Turing begins his 1950 paper with the claim "I propose to consider the question 'Can machines think?'" As he highlights, the traditional approach to such a question is to start with definitions, defining both the terms "machine" and "intelligence." Turing, however, chooses not to do so; instead, he replaces the question with a new one, "which is closely related to it and is expressed in relatively unambiguous words". In essence, he proposes to change the question from "Do machines think?" to "Can machines do what we (as thinking entities) can do?" The advantage of the new question, Turing argues, is that it draws "a fairly sharp line between the physical and intellectual capacities of a man." Later in the paper, Turing suggests an "equivalent" alternative formulation involving a judge conversing only with a computer and a man. While neither of these formulations precisely match the version of the Turing Test that is more generally known today, he proposed a third in 1952. In this version, which Turing discussed in a BBC radio broadcast, a jury asks questions of a computer, and the role of the computer is to make a significant proportion of the jury believe that it is really a man. Blay Whitby lists four major turning points in the history of the Turing Test — the publication of "Computing Machinery and Intelligence" in 1950, the announcement of Joseph Weizenbaum's ELIZA in 1966, Kenneth Colby's creation of PARRY, which was first described in 1972, and the Turing Colloquium in 1990. ELIZA works by examining a user's typed comments for keywords. If a keyword is found, a rule is applied which transforms the user's comments, and the resulting sentence is returned. If a keyword is not found, ELIZA responds with either a generic riposte or by repeating one of the earlier comments. In addition, Weizenbaum developed ELIZA to replicate the behaviour of a Rogerian psychotherapist, allowing ELIZA to be "free to assume the pose of knowing almost nothing of the real world." With these techniques, Weizenbaum's program was able to fool some people into believing that they were talking to a real person, with some subjects being "very hard to convince that ELIZA [...] is not human." Thus, ELIZA is claimed by some to be one of the programs (perhaps the first) able to pass the Turing Test, although this view is highly contentious (see below). Colby's PARRY has been described as "ELIZA with attitude": it attempts to model the behaviour of a paranoid schizophrenic, using a similar (if more advanced) approach to that employed by Weizenbaum. In order to validate the work, PARRY was tested in the early 1970s using a variation of the Turing Test. A group of experienced psychiatrists analysed a combination of real patients and computers running PARRY through teletype machines. Another group of 33 psychiatrists were shown transcripts of the conversations. The two groups were then asked to identify which of the "patients" were human and which were computer programs. The psychiatrists were only able to make the correct identification 48 per cent of the time — a figure consistent with random guessing. John Searle's 1980 paper Minds, Brains, and Programs proposed an argument against the Turing Test known as the "Chinese room" thought experiment. Searle argued that software (such as ELIZA) could pass the Turing Test simply by manipulating symbols of which they had no understanding. Without understanding, they could not be described as "thinking" in the same sense people do. Therefore—Searle concludes—the Turing Test cannot prove that a machine can think, contrary to Turing's original proposal. Arguments such as that proposed by Searle and others working on the philosophy of mind sparked off a more intense debate about the nature of intelligence, the possibility of intelligent machines and the value of the Turing test that continued through the 1980s and 1990s. 1990 was the fortieth anniversary of the first publication of Turing's "Computing Machinery and Intelligence" paper, and thus saw renewed interest in the test. Two significant events occurred in that year: the first was the Turing Colloquium, which was held at the University of Sussex in April, and brought together academics and researchers from a wide variety of disciplines to discuss the Turing Test in terms of its past, present and future; the second was the formation of the annual Loebner Prize competition. The Loebner Prize provides an annual platform for practical Turing Tests with the first competition held in November, 1991. It is underwritten by Hugh Loebner; the Cambridge Center for Behavioral Studies in Massachusetts, United States organised the Prizes up to and including the 2003 contest. As Loebner described it, the competition was created to advance the state of AI research, at least in part because "no one had taken steps to implement it." The first Loebner Prize competition in 1991 led to a renewed discussion of the viability of the Turing Test and the value of pursuing it, in both the popular press and in academia. The first contest was won by a mindless program with no identifiable intelligence that managed to fool naive interrogators into making the wrong identification. This highlighted several of the shortcomings of Turing test (discussed below): the winner won, at least in part, because it was able to "imitate human typing errors"; the unsophisticated interrogators were easily fooled; and the test itself is merely a distraction from more fruitful research. The silver (audio) and gold (audio and visual) prizes have never been won. However, the competition has awarded the bronze medal every year for the computer system that, in the judges' opinions, demonstrates the "most human" conversational behavior among that year's entries. Artificial Linguistic Internet Computer Entity (A.L.I.C.E.) has won the bronze award on three occasions in recent times (2000, 2001, 2004). Learning AI Jabberwacky won in 2005 and 2006. Its creators have proposed a personalized variation: the ability to pass the imitation test while attempting specifically to imitate the human player, with whom the machine will have conversed at length before the test. The Loebner Prize tests conversational intelligence; winners are typically chatterbot programs, or Artificial Conversational Entities (ACE)s. Early Loebner Prizes ruled restricted conversations: each entry and hidden-human conversed on a single topic, thus the interrogators were restricted to one line of questioning per entity interaction. The restricted conversation rule was lifted for the 1995 Loebner Prize. Interaction duration between judge and entity has varied in Loebner Prizes. In Loebner 2003, at the University of Surrey, each interrogator was allowed five minutes to interact with an entity, machine or hidden-human. Between 2004 and 2007 the interaction time allowed in Loebner Prizes was more than twenty minutes. In 2008 the interrogation duration allowed was five minutes per pair because the organiser (Kevin Warwick), and coordinator (Huma Shah) felt the artificial conversational entities were not technically advanced to converse for longer. Ironically, the 2008 winning entry, Elbot does not mimic a human; its personality is that of a robot yet it deceived three human judges it was the human during human-parallel comparisons. In parallel to the 2008 Loebner Prize held at the University of Reading, the Society for the Study of Artificial Intelligence and the Simulation of Behaviour (AISB), hosted a one-day symposium to discuss the Turing Test, organised by John Barnden, Mark Bishop, Huma Shah and Kevin Warwick. The Speakers included Royal Institution's Director Baroness Susan Greenfield, Selmer Bringsjord, Turing's biographer Andrew Hodges and consciousness scientist Owen Holland. No agreement emerged for a canonical Turing Test, however Bringsjord expressed that a sizeable prize would result in the Turing Test being passed sooner. A committee set up to organise events celebrating the 100th anniversary of Turing's birth in 2012, with a goal to take Turing's idea for a thinking machine, picturised in Hollywood movies such as Blade Runner, to a wider audience including children. Provisional members include Kevin Warwick, Chair, Huma Shah, coordinator, Ian Bland, Chris Chapman, Marc Allen, Rory Dunlop, Loebner winners Robby Garner and Fred Roberts. It is supported by Women in Technology and Daden Ltd. The Imitation Game, as described by Alan Turing in "Computing Machinery and Intelligence." Player C, through a series of written questions, attempts to determine which of the other two players is a man, and which of the two is the woman. Player A, the man, tries to trick player C into making the wrong decision, while player B tries to help player C.
There are at least three primary versions of the Turing test, two of which are offered in "Computing Machinery and Intelligence" and one which Saul Traiger describes as the "Standard Interpretation." While there is some debate as to whether or not the "Standard Interpretation" is that described by Turing or, instead, based on a misreading of his paper, these three versions are not regarded as equivalent, and their strengths and weaknesses are distinct. Turing, as we have seen, described a simple party game involving three players. Player A is a man, player B a woman and player C (who plays the role of the interrogator) of either gender. In the Imitation Game, player C is unable to see either player A or player B, and can only communicate with them through written notes. By asking questions of player A and player B, player C tries to determine which of the two is the man and which is the woman. Player A's role is to trick the interrogator into making the wrong decision, while player B attempts to assist the interrogator in making the right one. In what SG Sterret refers to as the "Original Imitation Game Test," Turing proposes that the role of player A be filled by a computer. The computer's task is thus to pretend to be a woman and attempt to trick the interrogator into making an incorrect evaluation. The success of the computer is determined by comparing the outcome of the game when player A is a computer against the outcome when player A is a man. If, as Turing puts it, "the interrogator decide[s] wrongly as often when the game is played [with the computer] as he does when the game is played between a man and a woman", it may be argued that the computer is intelligent. The Original Imitation Game Test, in which the player A is replaced with a computer. The computer is now charged with the role of the woman, while player B continues to attempt to assist the interrogator. The second version appears later in Turing's 1950 paper. As with the Original Imitation Game Test, the role of player A is performed by a computer, the difference being that the role of player B is now to be performed by a man rather than a woman. "Let us fix our attention on one particular digital computer C. Is it true that by modifying this computer to have an adequate storage, suitably increasing its speed of action, and providing it with an appropriate programme, C can be made to play satisfactorily the part of A in the imitation game, the part of B being taken by a man?" Common understanding has it that the purpose of the Turing Test is not specifically to determine whether a computer is able to fool an interrogator into believing that it is a woman, but rather whether or not a computer could imitate a human. While there is some dispute as to whether or not this interpretation was intended by Turing — Sterrett believes that it was and thus conflates the second version with this one, while others, such as Traiger, do not — this has nevertheless led to what can be viewed as the "standard interpretation.". In this version, player A is a computer and player B a person of either gender. The role of the interrogator is not to determine which is male and which is female, but which is a computer and which is a human. There has arisen some controversy over which of the alternative formulations of the test Turing intended. Sterrett argues that two distinct tests can be extracted from his 1950 paper and that, pace Turing's remark, they are not equivalent. The test that employs the party game and compares frequencies of success is referred to as the "Original Imitation Game Test," whereas the test consisting of a human judge conversing with a human and a machine is referred to as the "Standard Turing Test," noting that Sterrett equates this with the "standard interpretation" rather than the second version of the imitation game. 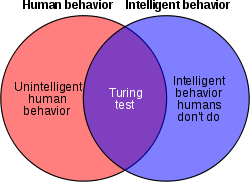 Sterrett agrees that the Standard Turing Test (STT) has the problems that its critics cite but feels that, in contrast, the Original Imitation Game Test (OIG Test) so defined is immune to many of them, due to a crucial difference: unlike the STT, it does not make similarity to human performance the criterion, even though it employs human performance in setting a criterion for machine intelligence. A man can fail the OIG Test, but it is argued that it is a virtue of a test of intelligence that failure indicates a lack of resourcefulness: the OIG Test requires the resourcefulness associated with intelligence and not merely "simulation of human conversational behaviour." The general structure of the OIG Test could even be used with non-verbal versions of imitation games. Turing never makes clear whether or not the interrogator in his tests is aware that one of the participants is a computer. To return to the Original Imitation Game, he states only that player A is to be replaced with a machine, not that player C is to be made aware of this replacement. When Colby, FD Hilf, S Weber and AD Kramer tested PARRY, they did so by assuming that the interrogators did not need to know that one or more of those being interviewed was a computer during the interrogation. As Ayse Saygin and others highlight, however, this makes a big difference to the implementation and outcome of the test.. However, Shah & Warwick, who have organised practical Turing tests, disagree; knowing/not knowing may make a difference in some judges' verdict. The power of the Turing test derives from the fact that it is possible to talk about anything. Turing wrote that "the question and answer method seems to be suitable for introducing almost any one of the fields of human endeavor that we wish to include." John Haugeland adds that "understanding the words is not enough; you have to understand the topic as well." In order to pass a well-designed Turing test, the machine must use natural language, reason, have knowledge and learn. The test can be extended to include video input, as well as a "hatch" through which objects can be passed: this would force the machine to demonstrate the skill of vision and robotics as well. Together, these represent almost all of the major problems of artificial intelligence. The Turing test is based on the assumption that human beings can judge a machine's intelligence by comparing its behaviour with human behaviour. Every element of this assumption has been questioned: the human's judgement, the value of comparing only behaviour and the value of comparing against a human. Because of these and other considerations, some AI researchers have questioned the usefulness of the test. The Turing test requires that the machine be able to execute all human behaviours, regardless of whether or not they are intelligent. It even tests for behaviours that we may not consider intelligent at all, such as the susceptibility to insults, the temptation to lie or, simply, a high frequency of typing mistakes. If a machine cannot imitate human behaviour in detail, bad typing and all, it fails the test, regardless of how intelligent it may be. This objection was raised by The Economist, in an article entitled "Artificial Stupidity" published shortly after the first Loebner prize competition in 1992. The article noted that the first Loebner winner's victory was due, at least in part, to its ability to "imitate human typing errors". Turing himself had suggested that programs add errors into their output, so as to be better "players" of the game. The Turing test does not test for highly intelligent behaviours, such as the ability to solve difficult problems or come up with original insights. In fact, it specifically requires deception on the part of the machine: if the machine is more intelligent than a human being it must deliberately avoid appearing too intelligent. If it were to solve a computational problem that is impossible for any human to solve, then the interrogator would know the program is not human, and the machine would fail the test. It only tests how the subject acts—the external behaviour of the machine. In this regard, it assumes a behaviourist or functionalist definition of intelligence. The example of ELIZA suggested that a machine passing the test may be able to simulate human conversational behaviour by following a simple (but large) list of mechanical rules, without thinking or having a mind at all. John Searle argued that external behaviour can not be used to determine if a machine is "actually" thinking or merely "simulating thinking". His chinese room argument is intended to show that, even if the Turing test is a good operational definition of intelligence, it may not indicate that the machine has a mind, consciousness, the ability to "understand" or have actual thoughts that "mean" anything (what philosophers call intentionality). The Turing test assumes that the interrogator is sophisticated enough to determine the difference between the behaviour of a machine and the behaviour of a human being. However, critics argue that this is not a skill that most people have. The precise skills and knowledge required by the interrogator are not specified by Turing in his description of the test. Chatterbot programs such as ELIZA have repeatedly fooled unsuspecting people into believing that they are communicating with human beings. In these cases, the "interrogator" is not even aware of the possibility that they are interacting with a computer. To successfully appear human, there is no need for the machine to have any intelligence whatsoever and only a superficial resemblance to human behaviour is required. Most would agree that a "true" Turing test has not been passed in "uninformed" situations like these. Early Loebner prize competitions used "unsophisticated" interrogators who were easily fooled by the machines. Since 2004, the Loebner Prize organizers have deployed philosophers, computer scientists and journalists among the interrogators. Michael Shermer points out that human beings consistently choose to consider non-human objects as human whenever they are allowed the chance, a mistake called the anthropomorphic fallacy: they talk to their cars, ascribe desire and intentions to natural forces (e.g. "nature abhors a vacuum"), and worship the sun as a human-like being with intelligence. If the Turing test is applied to religious objects, Shermer argues, then inanimate statues, rocks and places have consistently passed the test throughout history. This human tendency towards anthropomorphism effectively lowers the bar for the Turing test, unless interrogators are specifically trained to avoid it. Mainstream AI researchers argue that trying to pass the Turing Test is merely a distraction from more fruitful research. Indeed, the Turing test is not an active focus of much mainstream academic or commercial effort—as Stuart Russell and Peter Norvig write: "AI researchers have devoted little attention to passing the Turing test." There are several reasons. First, there are easier ways to test their programs. Most current research in AI-related fields is aimed at modest and specific goals, such as automated scheduling, object recognition or logistics. In order to test the intelligence of the programs that solve these problems, AI researchers simply give them the task directly, rather than going through the roundabout method of posing the question in a chat room populated with computers and people. Second, creating life-like simulations of human beings is a difficult problem on its own that does not need to be solved to achieve the basic goals of AI research. Believable human characters may be interesting in a work of art, a game or a sophisticated user interface, but they are not part of the science of creating intelligent machines—that is, machines that solve problems using intelligence. Russell and Norvig suggest an analogy with the history of flight: planes are tested by how well they fly, not by comparing them to birds. "Aeronautical engineering texts," they write, "do not define the goal of their field as 'making machines that fly so exactly like pigeons that they can fool other pigeons.'" Turing, for his part, never intended his test to be used as a practical, day-to-day measure of the intelligence of AI programs; he wanted to provide a clear and understandable example to aid in the discussion of the philosophy of artificial intelligence. As such, it is not surprising that the Turing test has had so little influence on AI research—the philosophy of AI, writes John McCarthy, "is unlikely to have any more effect on the practice of AI research than philosophy of science generally has on the practice of science." Turing predicted that machines would eventually be able to pass the test; in fact, he estimated that by the year 2000, machines with 109 bits (about 119.2 MiB or approximately 120 megabytes) of memory would be able to fool thirty per cent of human judges in a five-minute test. He also predicted that people would then no longer consider the phrase "thinking machine" contradictory. He further predicted that machine learning would be an important part of building powerful machines, a claim considered plausible by contemporary researchers in artificial intelligence. By extrapolating an exponential growth of technology over several decades, futurist Raymond Kurzweil predicted that Turing test-capable computers would be manufactured in the near future. In 1990, he set the year around 2020. By 2005, he had revised his estimate to 2029. The Long Bet Project is of $10,000 between Mitch Kapor (pessimist) and Kurzweil (optimist) about whether a computer will pass a Turing Test by the year 2029. The bet specifies the conditions in some detail. Numerous other versions of the Turing test, including those expounded above, have been mooted through the years. A modification of the Turing test wherein the objective of one or more of the roles have been reversed between machines and humans is termed a reverse Turing test. An example is implied in the work of psychoanalyst Wilfred Bion, who was particularly fascinated by the "storm" that resulted from the encounter of one mind by another. Carrying this idea forward, R. D. Hinshelwood described the mind as a "mind recognizing apparatus", noting that this might be some sort of "supplement" to the Turing test. The challenge would be for the computer to be able to determine if it were interacting with a human or another computer. This is an extension of the original question that Turing attempted answer but would, perhaps, offer a high enough standard to define a machine that could "think" in a way that we typically define as characteristically human. CAPTCHA is a form of reverse Turing test. Before being allowed to perform some action on a website, the user is presented with alphanumerical characters in a distorted graphic image and asked to type them out. This is intended to prevent automated systems from abusing the site. The rationale is that software sufficiently sophisticated to read and reproduce the distorted image accurately does not exist (or is not available to the average user), so any system able to do so is likely to be a human. The implication would appear to be (although is not necessarily) that artificial intelligence has not as yet been achieved. The Immortality-test variation of the Turing test would determine if a person's essential character is reproduced with enough fidelity to make it impossible to distinguish a reproduction of a person from the original person. The Minimum Intelligent Signal Test, proposed by Chris McKinstry, is another variation of Turing's test, where only binary responses are permitted. It is typically used to gather statistical data against which the performance of artificial intelligence programs may be measured. Yet another variation is the Meta Turing test, in which the subject being tested (say, a computer) is classified as intelligent if it itself has created something that the subject itself wants to test for intelligence. The organizers of the Hutter Prize believe that compressing natural language text is a hard AI problem, equivalent to passing the Turing test. It gives a single number that can be directly used to compare which of two machines is "more intelligent". It doesn't require the computer to lie to the judge -- teaching computers to lie is widely regarded as a bad idea. It is unknown what particular "score" on this test -- if any -- is equivalent to passing a human-level Turing test. ^ Turing originally suggested a teletype machine, one of the few text-only communication systems available in 1950. ^ Language, Truth and Logic (p. 140), Penguin 2001. ^ "Intelligent Machinery" was not published by Turing, and did not see publication until 1968 in Evans, C. R. & Robertson, A. D. J. (1968) Cybernetics: Key Papers, University Park Press. ^ Turing 1952, pp. 524-525. Turing does not seem to distinguish between "man" as a gender and "man" as a human. In the former case, this formulation would be closer to the Imitation Game, while in the latter it would be closer to current depictions of the test. ^ Turing 1950 and see Russell & Norvig 2003, p. 948, where they comment, "Turing examined a wide variety of possible objections to the possibility of intelligent machines, including virtually all of those that have been raised in the half century since his paper appeared." ^ a b c Shapiro 1992 and Shieber 1994, amongst others. ^ Shah, Huma (15 January 2009). "Winner of 2008 Loebner Prize for Artificial Intelligence". Conversation, Deception and Intelligence. http://humashah.blogspot.com/. Retrieved on 29 March 2009. ^ Transcripts can be found at "Loebner Prize". http://www.loebner.net/Prizef/loebner-prize.html. Retrieved on 29 March 2009. ^ "ALICE Anniversary and Colloquium on Conversation". A.L.I.C.E. Artificial Intelligence Foundation. http://www.alicebot.org/bbbbbbb.html. Retrieved on 29 March 2009. ^ "Loebner Prize 2008". University of Reading. http://www.reading.ac.uk/cirg/loebner/cirg-loebner-main.asp. Retrieved on 29 March 2009. ^ "AISB 2008 Symposium on the Turing Test". Society for the Study of Artificial Intelligence and the Simulation of Behaviour. http://www.aisb.org.uk/events/turingevent.shtml. Retrieved on 29 March 2009. ^ Turing 1950 under "Critique of the New Problem"
^ Russell & Norvig (2003, pp. 958-960) identify Searle's argument with the one Turing answers. ^ Turing 1950, under the heading "The Imitation Game", where he writes, "Instead of attempting such a definition I shall replace the question by another, which is closely related to it and is expressed in relatively unambiguous words." Searle, John (1980), "Minds, Brains and Programs", Behavioral and Brain Sciences 3 (3): 417–457, http://members.aol.com/NeoNoetics/MindsBrainsPrograms.html . Page numbers above refer to a standard pdf print of the article. See also Searle's original draft. Larry Gonick, The Cartoon Guide to the Computer (1983, originally The Cartoon Guide to Computer Science). ISBN 0-06-273097-5. Saygin, A.P. & Cicekli I (2002): Pragmatics in human-computer conversations (Abstract and links to pdf, if permitted), Journal of Pragmatics, Volume 34, Issue 3, March 2002, Pages 227-258. Machines Who Think": Scientific American Frontiers video on "the first ever [restricted] Turing test." This page was last modified on 7 April 2009, at 06:43.